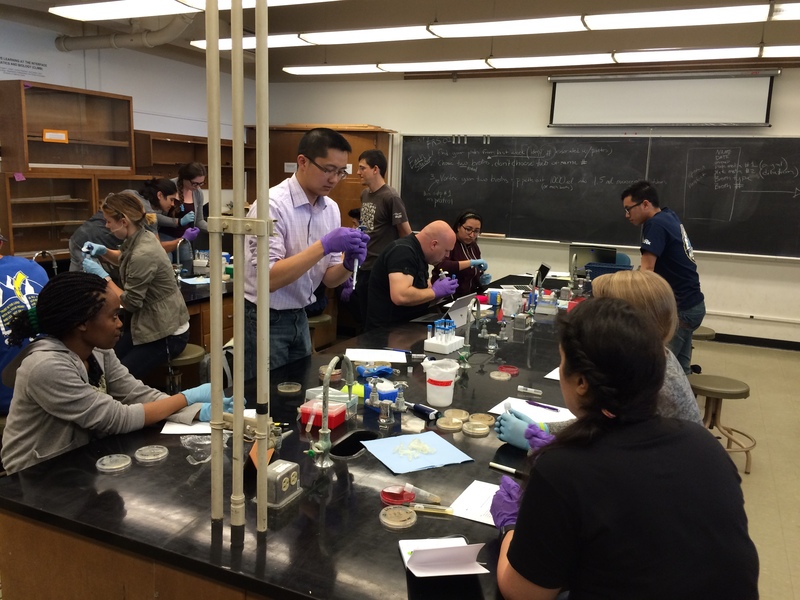 Swabs to Genomes Class: Summary and Course Materials – microBEnet: the microbiology of the Built Environment network. A few weeks ago we wrapped up Spring Quarter here at UC Davis and the end of our experimental “Swabs to Genomes” class, taught as a freshman seminar. 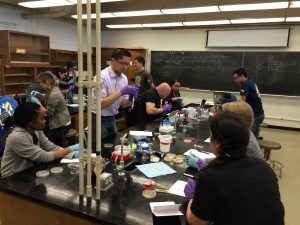 As we introduced here, the idea was to take a set of students from colonies on a plate (from a swab) through a collection of ready to publish sequenced and assembled bacterial genomes by the end of the quarter. Amazingly enough, this actually worked… by the last day of class we had submitted 10 genomes to NCBI and had a draft of a Genome Announcement publication almost ready to submit! It was an interesting journey for both the students and the teachers. Here is a link to the blog for the class, where the students blogged about the process each week. Next here is a collection of all the course materials, including the syllabus, handouts/assignments for each day, pre-/post-assessments, the lab notebook we kept as a class, and more. This class was taught by Ashley Vater and myself, and we thought we’d take the opportunity here to reflect on the course from our perspective. -This was a significant amount of work for the instructors. Because of the compressed timeframe (only meeting once a week, 2 hours each time, for 10 weeks) the students couldn’t do all the work. For example, they did dilution streaking, then we did the overnights, they did the DNA extractions, then we did the PCR, they confirmed the PCR products and then we made the sequencing libraries. The sequencing libraries took the two of us an entire 8.5 hour day to prepare which wasn’t the most fun in the world. This structure is also problematic because it doesn’t facilitate the concept of reiteration in research, which is a valuable learning goal for the students. The mantra of effective work management for these kinds of classes should be “make the students do it”. It would have been great if we had a class structure that would better accommodate this idea. However, the compressed timeframe was a great way to pilot this project. -There is a tradeoff in a class of this nature between ownership, awesomeness, and logistics/cost. In this case the students reported a very strong sense of ownership over their bacteria, and it was awesome for them to be able to be authors on a publication describing the results. However, the logistics were complicated and the cost was quite high… ~$3,700 for 14 students so around $270 per student. One could imagine a similar course, where the students didn’t actually sequence genomes but went from identification to bioinformatics of existing genomes. Then they would retain some ownership (working with a close relative of “their” bug), at a much much lower cost and complication… however, it’d be unlikely any publishable data would result. Another version could be to work on existing data from a lab which could be publishable and potentially very cheap (assuming the data was generated for some other purpose) but there would be a limited sense of student ownership over the data. -Google Docs worked really well for organizing a class of this nature. In particular the lab notebook was great because we could keep adding data (DNA quantification, species identification, etc) all in the same place. The unanticipated benefit of using Google Docs was the ability to use the “Revision History” to quantify and observe contributions to group writing projects such as the blog posts and the draft Genome Announcements. We used Google Forms for the many of the pre-class readings and reflections, which output to instantly organized spreadsheets. The handouts were also posted as editable Google Docs. 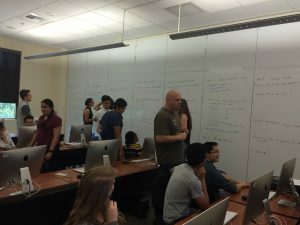 For some weeks’ lab participation points, students were asked to fix errors in the handouts in real time as they moved through that day’s workflow. The handouts were not perfect or completely clear to start with and the students contributed to their improvement. We liked this activity because we think it is a powerful teaching tool, as it asks them to troubleshoot and think critically, while also giving the students a deeper sense of ownership. -It was hard to assess content-based student learning in this class because the overarching course goals revolve around the concept of exposure and not deep understanding. Students in the class were not expected to become experts and our assessment is mostly comprised of attitudinal surveys and short responses to targeted reflection questions. We will conduct our survey and student data analysis of later this summer. We hope to see developments in students’ ideas of “what being a scientist” means, and their attitudes about the utility of computing in biology. You can check a full list of our course goals and our pre and post surveys in the folder linked above. -This course was really fun to teach! It was great to interact with and see our student learn from us and particulate from each other. This particular group was all transfer students, which was ideal because we had a rich diversity of backgrounds and abilities — resulting in a lot of peer teaching and active learning. In the fall we’re going to to make some major changes and try this again… stay tuned!